It's been a while since I published a blog post so I thought it'd be a good idea to come on here and give you guys a little re-cap of what has been going on and the plans I have for the future! Since I have been a bit MIA on this platform I have a seriously goal to get out at least ONE blog post published every week, obviously if there is more then great, but I'd really like to set this goal and begin accomplishing it! Whether it be a YouTube video correlated blog post, or a photo set, or an inspirational blog post, ANYTHING. ONE, needs to come out a week! I'm considering changing up the website a bit, just simple little changes to refresh the vibe of it! I'll share what I do with you as I go along and of course update you guys on all new content! As some of you may know, I started a YouTube channel! It's kinda crazy that I haven't talked more about my new channel on here, considering I started the channel BECAUSE of my blog! I know a lot of you enjoy reading blog posts but would also like a video version! You ask.. and you shall receive! My idea is that for every video I will also write a corresponding blog post! Yes, it's a lot of work! But hey! I know I can get it all done, and I figure, the more content coming out... the better! Right?! 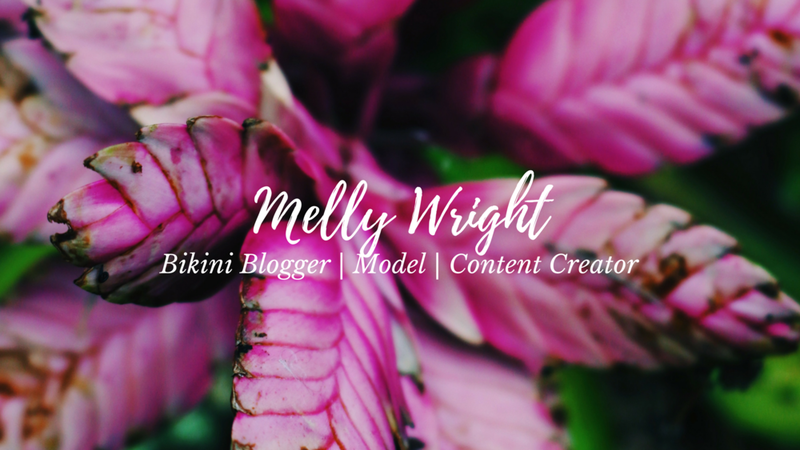 So far I have two YouTube Video ~ Blog Post duos, the Midori Bikini Review and the Black Bough Swimwear review! I wasn't ever too proud of the Black Bough Swimwear video, it was my first video and although I was so excited to upload, I knew that I could do better! Now, SOMEHOW... it's literally the most viewed video on my channel. BUT... stay tuned as I have TWO new YouTube videos coming in collaboration with Black Bough Swimwear again! I will film a video, edit and then write the corresponding blog post. The blog post will be linked in the YouTube description box and the YouTube video will be linked clearly on the blog post! Be on the lookout for AT LEAST, one new video and blog post per week! I am sure you guys have noticed that I am still learning how to film, edit, find music, I'm learning it ALL! I know it takes time and practice to know what you're doing and I am seriously so excited to learn what works for me and what doesn't in this industry! For the mean time, I knew I really was in need of a proper background in my videos. Something that could give me a consistent vibe, but one that I could still change around! I decided to go with a clothing rack that I would display by bikinis on! I literally just put it together and I am so excited to film a new video against it! I have SO MANY "Bikini Review + Try on" Videos and well as "My Current Bikini Favorites" Videos planned and already in the works! I'm loving creating on YouTube and I am so thankful to all of you who subscribe, like and comment on my videos! So definitely stay tuned for the new weekly videos and blog posts! I have so much good stuff coming and amazing collaborations being set in stone for YoutTube, Tan Lines Bikini Blog, and my Instagram! My Instagram isn't going to be changing at all, I just have a ton of awesome images from my Maui trip to share & plenty of collaborations coming from the month of February and into March! Then the following month of April I will but in Tulum for a week creating some amazing tropical content! I am so excited to share the new photos with you guys and always appreciate your love! Anyways! I hope this was a nice little refresher into the coming weeks and months! Lot of fun stuff is happening and I am so excited to continue sharing with you guys through these amazing platforms! If you have any blog post suggestions, or YouTube video suggestions please leave a comment on this blog post!